breast cancer research is important. I lost my grandma to breast cancer. Wonderful post, Dori. I'm pretty good with my monthly self-checks. Susan Koman's Foundation is my fave. I went on the walk for the cure while aboard my honeymoon cruise this past April. Carnival Cruise line calls it On Deck for the Cure. I still wear the pink bracelet I got there every day. So true...it is a really important cause. I am so sorry that you lost your grandma that way. Hugs to you my friend. Great post, Dori. 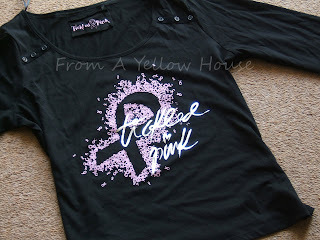 I am so glad that breast cancer so now on the forefront. I wear shirts and buttons displaying the logo whenever I can. Now you gave me another choice. And you're right about breast cancer. Men get it, too. And we DO need to take care of each other. You reminded me of my Uncle Jimmy who died of breast cancer when you talked about men needing to check themselves as well. I talked about him briefly in my post today. Thanks for the focus with this one. I'm glad you like my shirts. :-) Yeah, I do think that it needs to be highlighted that men get it too. You don't really think about men when it comes to discussing breast cancer, but I personally know 1 woman who's had it and 3 men - strange how our perceptions don't always match the reality. This is so true. The perception is often that it is just women, but as you have shown by your example, it happens to men too. I am just so pleased that we are having this conversation here. Thanks so much for adding your voice. What a great reminder. I have a friend that has just battled a round of it. She is beating this so far. She is getting ready to walk for the Susan G. Koman walk. I am so proud of her. Thank you for an important post reminding us about breast cancer awareness. My horses wear "pink" sheets and blankets and use "pink" halters and leads. 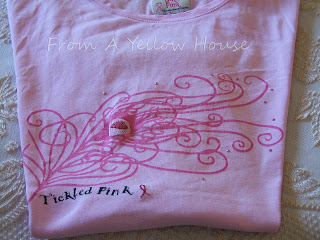 I'm off to look for my own pink shirt now that I've seen yours. We can never do too much to support cancer research and raise awareness. GReat post. This week is feel my boobies week so this is so appropriate. Great shirts too. I'm so excited. This is my first tag! :-) Thanks. I'm glad to know that you are having "feel your boobies" week. :-) I've recently bought this glove thing that helps with checking too. I am still getting used to it. I'm so glad that more awareness is out there.